What do you sound like? What is vibrating around you or better said from within you? 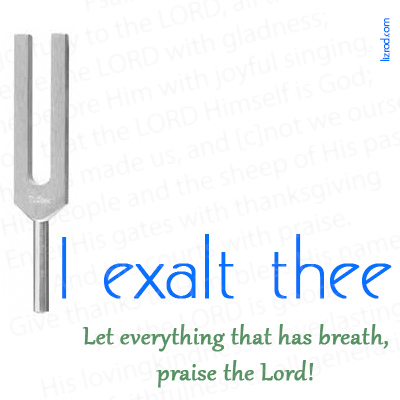 Yesterday I was worshipping the Lord and singing the song “I exalt thee” as I was getting ready to make lunch. This had never happened to me before. I guess because of the position I was standing in the episode became more noticeable to me. I had a frying pan in my hand and as I was singing the sound seemed to be “caught” by the metal pan and I felt the song I was singing in my hand. It was a chilling beautiful experience. Immediately, the Holy Spirit spoke and said this is the way it should be wherever you go! WOW, no matter where our feet tread the sound that should be emanating from us should be a sound that turns others to the Lord. It should cause those around us to feel the heart of worship. Those who encounter us should be able to catch and enter the atmosphere of praise. In all we do, those who meet us should be drawn into the presence of the Lord. I actually felt it. It was so lovely and simple. And it drew me in closer. We are like tuning forks. Those that “bump” into us should be able to tune into an atmosphere of worship. Yes, all of us who bear his Name! Resonate his beauty! Vibrate and let those around you feel the atmosphere change.